Much has changed since Cancer Care West was established as The Leukaemia Trust in 1993. Find out about the changes and developments at Cancer Care West over the past two decades. Cancer Care West was established as The Leukaemia Trust in 1993 to establish a charitable base for the development of Haematology and Medical Oncology services. The charity’s title – the Leukaemia Trust – was taken from the main focus of disease that support was sought for, but with a broader brief than Leukaemia as its goal. In the years that followed, the charity raised funds to support Haematology and Medical Oncology services at Galway University Hospital through a programme of patient support and new therapy development, research and education in Cancer and Leukaemia care. It became apparent at an early stage that the name Leukaemia Trust was too restrictive within the overall brief adopted. At a national level in recent years, the need to develop regional cancer centres was recognised. Through the lobbying of the Leukaemia Trust and the work of many people, Galway has since become such a regional centre. It is in this context, and with our concerns that the title Leukaemia Trust conveyed too narrow a profile of interest for the Charity, that the Charity registered its operating name Cancer Care West. 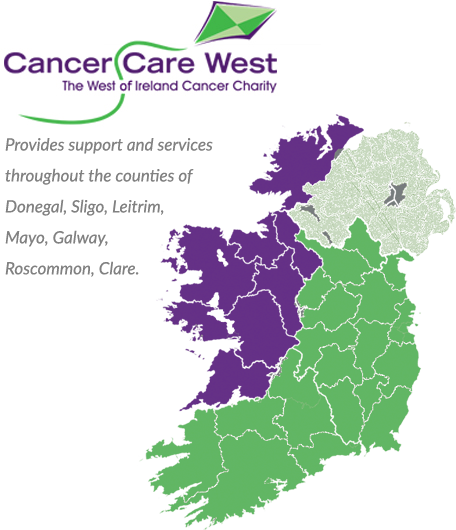 In March 2007 Cancer Care West opened its residential facility, Inis Aoibhinn, at University Hospital Galway. This was followed in July 2009 with the opening of a dedicated Cancer Support Centre at Westside, Galway. Since then Inis Aoibhinn and the Galway Cancer Support Centre have supported thousands of people affected by cancer and Cancer Care West continues to expand our range of support services with the establishment of our Psycho-Oncology service, Patient and Family Support Programme and Support Services for Children.